Ack! It just hit me that today was July 1 and that we have a long weekend. On top of that, our neighbors are throwing a holiday bash and expecting contributions. I’ll probably take dessert, but like every Fourth of July, I can’t decide what. Red, white and blue desserts just aren’t my thing. Either I’m secretly un-patriotic or it’s because they always involve food dye or red fruit roll-ups or decorating bags and crafty talent. Probably the latter. That being said, I’ve managed to hack out a few things. 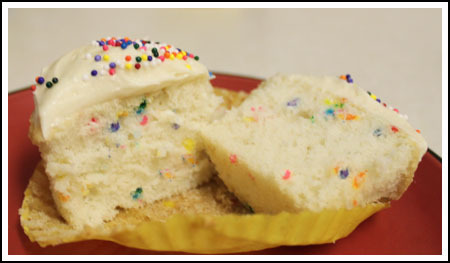 For instance, these confetti style cupcakes could easily be made with red, white and blue sprinkles or (again) the food dye. 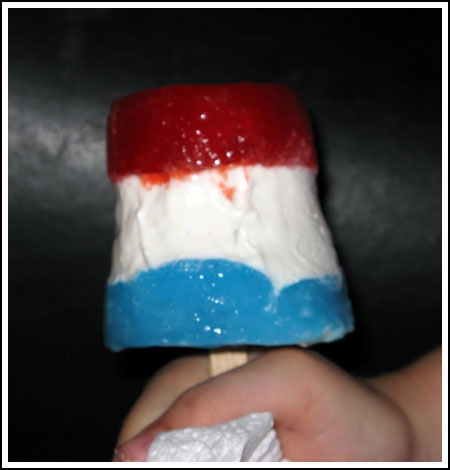 And then one year I made these cool Red White and Blue Ice Pops. The kids liked them. 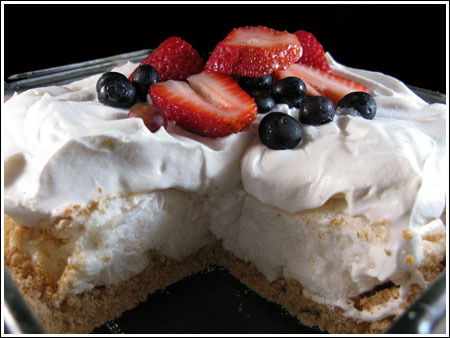 And there was this Red White and Blue Meringue Berry Dessert, though it’s not necessarily something you’d carry over to the neighbor’s backyard. 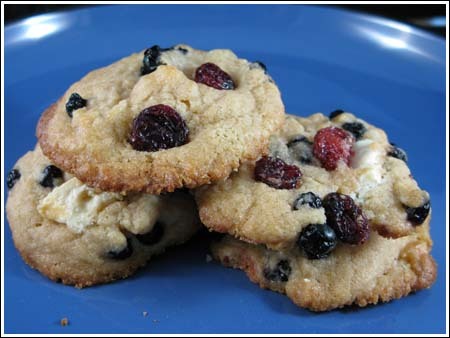 You could carry over a batch of these Red White and Blueberry Cookies, which are very tasty, but likely to get overshadowed by somebody’s darn flag cake. 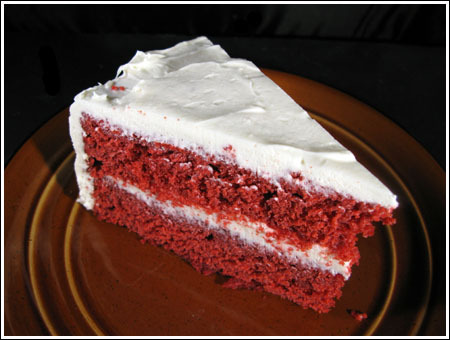 In which case you might prefer to make Red Velvet Cake, which won’t get overshadowed by anything. Everyone loves it, though it’s not necessarily patriotic without a layer of blue velvet or at least some sprinkles. Hmmm, sprinkles would look good on this cake, don’t you think? So that’s my skimpy July 4 round-up. I need to come up with something better, so if you have any suggestions, let me know. Oops forgot to include site! Anna, I can’t imagine anything you would make would turn out unsightly! Here is the allrecipes recipe I follow. Using raspberries is much easier for the stripes than strawberries, but I like the strawberries flavor better. I have a friend who is allergic to food coloring so I’ll be making a pound cake instead of using cake mix this year. And thank you for replying to all of us!!! It is probably a full time job keeping up with and emptying your email inbox! Cindy, my grandmother was known for her angel food cake and she always used a mix. She made the Seven Minute Icing from scratch, but nobody ever noticed or cared that it was a mix. Louise, there’s a lady on my street who seems to specialize in dip. Katie, dessert pizza is a good idea! Pam, I’ve never made a gooey butter cake…..or at least a real one. I tried the mock one with cake mix and cream cheese, but didn’t care for it. Smitten Kitchen has a scratch version on her site that looks really good and I’ve been meaning to try it forever. Martha, the S’mores cups are too cute. Plus I have all the ingredients. Thanks for that link! Sue, I forgot a bout the red velvet cheesecake cups. Gwen, that’s a good one for a sit down dinner. Our neighbors wander all over the place so I need something I can just set on a table for people to come back to. Molly and Katrina, you can’t go wrong with red, white and blue sprinkled sugar cookies. I’ll probably serve those to the kids. Adults like them too, of course. Joe, those push up pops on Betty Crocker were eye catching, but not very practical seeing how long it takes to get the push-up pops. I suppose if you ordered them now you could make them for Halloween (orange and chocolate) or Christmas (green and red). It’s a cute idea, though. Carlyn, speaking of dyed cheesecake, have you ever seen the tie dye one from Disney’s Pop Century resort? Imagine that in red, white and blue. Darlene, Todd and Fuzz would LOVE that recipe. Our neighborhood parties are too disorganized to serve trifle, though. I would have to sit and babysit the trifle to make sure it stayed cold. Still, that might be an option. Gloria, I would happily eat flag cake. I think I’m intimidated by flag cakes because the ones you see in ads are so perfect. Mine would not be. Maybe I’ll buy the ingredients and let the kids make one. Joe, that dessert was definitely eye catching. It’s a cute way of using the plastic containers, but not exactly practical because most people will have to special order those. Maybe you could special order them now and make red and green ones for Christmas. I like the look of the red, white, and blue cookies. Not sure why the flag cake is getting a bad rap…I love making that cake. Every year it is a hit. It is just yellow cake mix (food coloring in there I suppose so you could make one from scratch), cool whip frosting, strawberries and blueberries. Since my family only gets it once per year, they never get tired of it. It is light, creamy, fruity and easy to make!!! If you don’t want to cut strawberries, you can use raspberries. As long as it can be refrigerated until serving, I would take Kraft’s Holiday Cherry Delight, which is made in a trifle dish/bowl. I’ve only made it once, but I was amazed how everyone had second and third servings of it when I took it to a dinner party. I’m not particularly fond of the ingredients on their own, but together they taste very good. In addition to the pound or angel food cake (white), Cherry Jello & Cherry pie filling (red), you could toss in some blueberries. If I had time to get plastic push up containers, I would so be making something like these this weekend! I think blue star sprinkles or just the little round ones would be fun on the red velvet cake. Happy Independence Day! These are neat ideas! I love the ice pops. They are too cute! I made red, white and blue fruit skewers and star shaped sugar cookies. I decorated the sugar cookies with red white and blue sugars and cookies glazes. I might have to try out the ice pops over the weekend! I agree that you can skip food coloring, flag cakes, etc. and still be perfectly patriotic. I do think blue or red, white and blue sprinkles on red velvet, or red velvet cake cupcakes would be perfect! Ooh how about if you made those cream cheese red velvet cupcakes of yours and baked them in blue liners? Then you wouldn’t have to frost them either!! A few weeks ago Joe at Culinary in the Desert/Country made S’mores cookies. They seem great for the fourth. I made them and liked them and meant to get them up on my blog but haven’t done gotten to it yet. Today I’m being totally traumatized by cake and my oven. It’s been an awful baking day. sigh….. I think this is what bakeries are for. I volunteered to organize a pre-Fourth lunch for my department with hot dogs & various sausages as the main course. I wanted a picnic-ish dessert to make & found these Smores Cups online. I thought there was barely enough crumb mixture, so next time I would increase the recipe by one graham cracker & perhaps reduce the butter (the mixture was very wet). The recipe originally came from a Pampered Chef consultant (which I was 20 yrs ago) and the tart shaper makes the job of making the cups so easy. I also used about 8 chocolate chips instead of Hersheys because it’s what I had, and broiled the marshmallows for 1-2 minutes (watch carefully – they burn quickly). My co-workers loved the finished product & many asked for the recipe. I know you’ve made Smores Bars, but how about putting your little one to work making these? Have a great holiday! I made a Red Velvet Gooey Butter Cake with red, white, and blue sprinkles on top. I also put white chocolate chips in the filling. If it wasn’t going to an outdoor function, I would have spread whipped cream on top of the filling (after baking) then the sprinkles. I agree with you about the food coloring. We’re having people over the 4th and I couldn’t figure out my dessert but I just got my Betty Crocker email. They showed a Brownie ‘n Berries Dessert Pie that has shot to the top of my list. Lots of fresh fruit plus chocolate and no food coloring!! I just saw what I’m making for the 4th when I got my Betty Crocker email today… Brownie ‘n Berries Dessert Pizza. Looks pretty darn tasty and no food coloring but lots of fresh fruit!! Let someone else use the food coloring. 🙂 I’m not much for that anyway. I think Spinach and Artichoke Dip with pita bread would be fine. I agree with you about food dye and flag cakes. My first choice would be an angel food cake from a mix, my bad, and serve it with strawberries and blueberries and Cool Whip. But since it’s supposed to be 117 here tomorrow, I’d probably make rice krispies treats and work the red and blue in somehow.